A couple of new start-ups, Spreecast and LiveLead, are focused on the social side of video, working on helping groups of people broadcast themselves or enjoy videos together, respectively. They both have a lot in common with Google+ Hangouts. San Francisco-based Spreecast is StubHub founder Jeff Fluhr’s next act, and it offers live group-video sessions that are instantly archived. It’s focused on people who want to be broadcasters — like bloggers or offline personalities — and who can attract an audience. 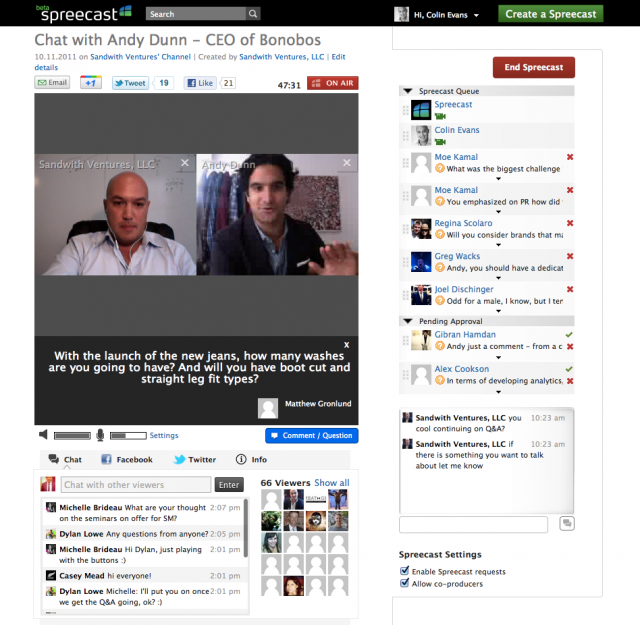 Spreecasts, which are by default public, have up to four people on camera at a time, while others participate in text chat through their choice of Facebook, Twitter or Spreecast account. The person who starts the conversation gets access to a producer control panel that brings in new questions and speakers. All sorts of companies have tried this sort of thing with varying degrees of success, like Tinychat, Paltalk, Livestream (now more focused on events), Socialeyes (haven’t heard from them in a while) and Operator11 (now defunct). What I’d love to see is something that starts out with a multiplatform approach to social video, but Spreecast is built for just the Web, and all its video runs in Flash. Now that Adobe is halting development on Flash for mobile devices, that gap is only going to get harder to bridge. Another new company in the space is LiveLead. 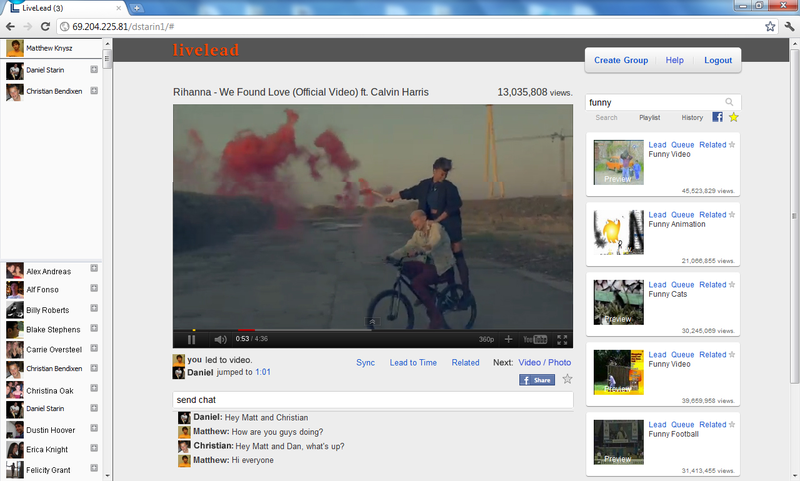 Where Spreecast is about public Webcam conversations, LiveLead is about private sharing of video and photo content. LiveLead, which currently requires a Facebook account to join, sets up private rooms where friends view content and text chat about it. Anyone in the room can take the lead and push something new for everybody to watch. Again, this isn’t that novel an idea. Others, like ClipSync, Google Hangouts, and even the new Flickr Photo Sessions, provide communal content-viewing experiences. LiveLead’s angle is that it focuses on people who are already friends. New York City-based LiveLead has a team of three — a former Wall Street finance guy, a graduate student in computer security, and a former privacy-focused social network researcher — and is angel funded.